Paytm Travel Buddy Referral Code: Paytm is running a refer and earn offer where you can invite your friends. When your friends book there first ever flight or bus ticket they have to use your invite code. Your friend will get flat 10% cashback of the flight ticket price to their Paytm wallet. Whereas, they will get flat 20% cashback of the bus ticket price to their Paytm Wallet. Moreover, for every ticket, you will earn Rs. 250 cash back on flight ticket and Rs. 50 on bus ticket booking. You will get your cash back once your friends complete their journey. Paytm is naming this referral offer as Paytm Travel Buddy Program. A user will earn up to Rs 250 for every friend they invite. 1) Download and install Paytm Mobile App. 2) Login to your Paytm account. 3) Click n “Flight” option. 4) Check banners below “Search Flights” button. 5) Click on the third banner where it is written Get Rs. 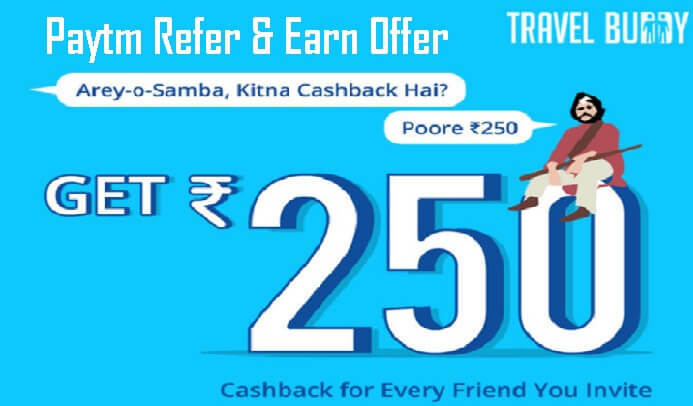 250 cashback for every friend you invite. 6) You will find your Unique Invite Code on that page. 7) Click on Invite Friends to share the direct link to your friend for booking ticket. 13. Paytm reserves the right to amend terms and conditions or terminate the Travel Buddy program at any time without any prior notice.